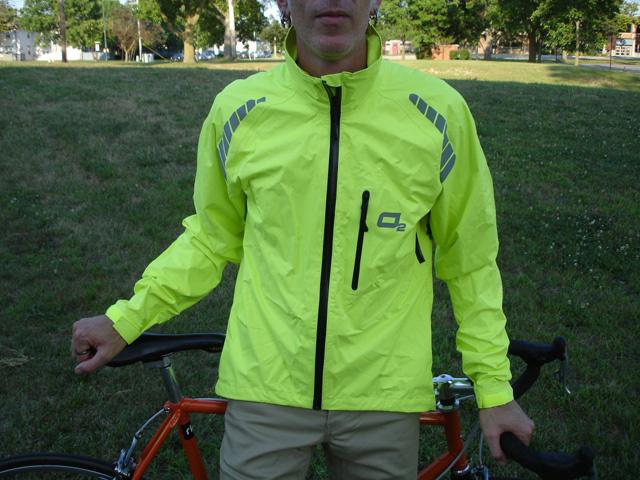 At the tail end of spring, Adam Ziskin, owner of O2 Rainwear in Minneapolis, contacted us to see if we wanted to check out one of their rainjackets. Since I recently moved to the midwest, which has its rainy season(s) in cooler temperatures than my previous home of Florida, I volunteered to be the tester. There’s nothing I hate worse than being cold and wet; with little body insulation, I really suffer when the cold rains come down. As you can see from the specs, it’s one of those laminated fabrics that is waterproof yet breathes…this isn’t a cheap polyurethane-coated nylon rainjacket. And, it’s very packable…I am hoping it will roll up tightly enough to fit in a jersey pocket for those iffy ride days. Normally, I wear small sizes, but Adam sent me a medium based on my dimensions. The jacket doesn’t hug me as tightly as I thought it should…and this is actually a good thing as it will allow me to do some base-layering when the weather turns chilly. 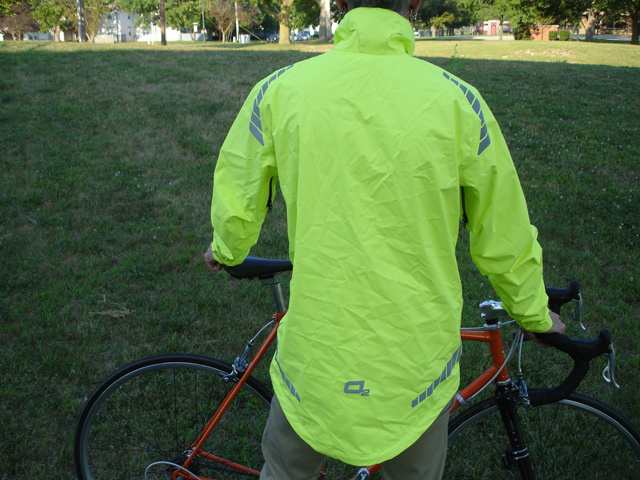 When it is raining and overcast, extra visibility is always a good idea for commuters, and the Calhoun has us covered day and night: bright yellow coloring and reflective patches/trim on front and back. If you prefer something a little less hi-viz, the Calhoun also comes in a blue model. The jacket has long sleeves with simple hook-and-loop closures — sleeves long enough to provide full coverage even when slumped over in the drops of a roadbike — and an extended tail to keep the rider’s backside dry and stripe-free. This jacket represents a bit of a first for me: in all my years of riding, I have never used or owned a cycling-specific rainjacket. I have “made do” with a variety of ponchos, cheap windbreakers and plastic trashbags…and many times nothing at all, but never something designed and constructed for the specific task of keeping a bicyclist dry and warm. So, I am quite excited to give this jacket a real shakedown, as much as I dislike riding in the rain. Stay tuned for the full review sometime this fall. While you’re waiting, swing on over to O2’s website to get a look at some of their other products — it looks like there’s something for everyone of the bikey persuasion. I wonder what it costs. Rider — I didn’t want to give too much away before the actual review, but the Calhoun runs around $120. My first impressions say that this is an entirely reasonable price.